La Alma Pool located at Lincoln Park in central Denver was one of the city’s oldest recreational structures that had lasted for over 100 years. In 2008, Counsilman-Hunsaker conducted a Facility Audit at the La Alma Pool to assess various issues concerning the lifecycle of the pools and to make recommendations for repairs and/or renovation. The pool did not meet current Colorado public swimming pool health code requirements, and was not operating as designed. Identified issues included structural instability, pool water loss, and functional problems with the recirculation system. 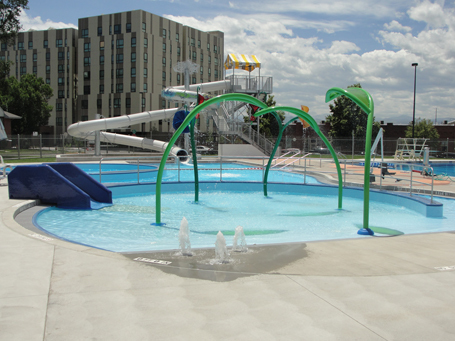 City officials decided to demolish the existing outdoor pools and replace it with two family-friendly pools: a lap pool and a recreation pool. Funding for the project came from the Better Denver Bonds Program approved by voters in 2007. The facility also includes a new pool bath house and another building for staff offices and mechanical equipment.